to be quite handy for addressing behavioral issues when a switch wasn't readily available. of gender, were unmoved by cars with names like Hot Heap, Mod Quad and Peeping Bomb. clothing. 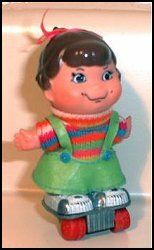 Their backs and bottoms of their skates are marked "1970 Mattel Inc. Hong Kong". Today these hard-to-find kids are the favorites of both doll and Hotwheels collectors. missing paint is pretty common. were marked Hong Kong on their base in the same place as the kids.